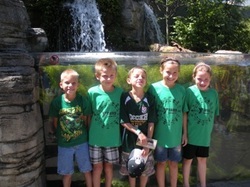 Adventure is a group designed for children entering second and third grade. This group focuses on strengthening positive social interactions and practicing skills to build teamwork. Campers in Adventure will participate in a team building game and have time set aside for small group games in an effort to build teamwork and communication skills. They will also begin to work on learning the rules and skills needed to play popular camp and team sports during their group sport activity. Additionally, campers will listen (and hopefully volunteer to help read) a story each day related to the theme of the week. Campers will then apply the story to their arts and crafts activity. Campers in Adventure will receive swimming lessons each week and have the opportunity to attempt their deep water swimming test. Campers swim for 40 minutes each day.